Wedding cake tree (Cornus controversa): growing, planting, caring. A surprising tiered tree - often known in its variegated form. Cornus controversa - the wedding cake tree - is a species of the dogwood family Cornaceae native to China, Korea, the Himalayas and Japan. 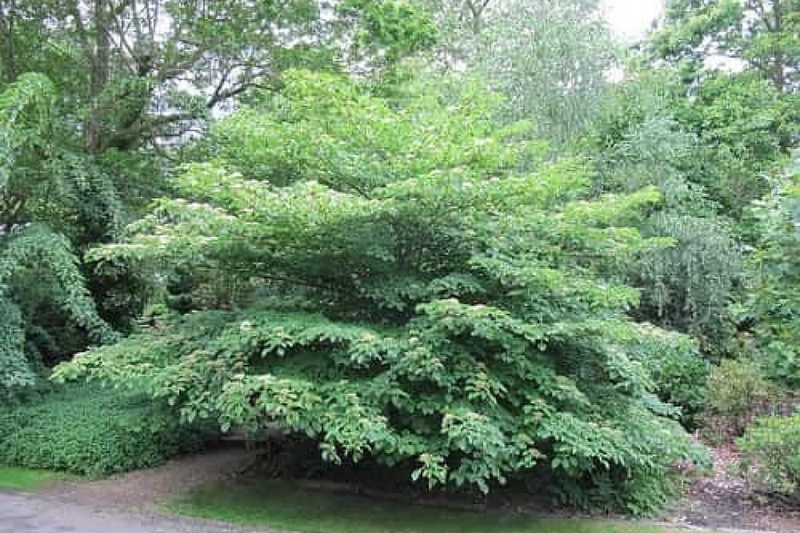 It is a deciduous tree growing to 15m tall, with a distinctive tiered branching pattern, glossy, elliptic leaves often turning purple in autumn and flat clusters of small white flowers. Shrub up to 4 m tall, erect, tabular, single-leaved, deciduous, alternate, turning dark red in autumn. White flowering in July-August. The first month and the first year, water each week if rainfall is low, filling the hollow that you formed at planting. Fertilize each year before the winter, by a contribution of compost on the top, which you will cover with mulching. Cut only dead, damaged, or intersecting branches.